Come home to the Christiansens—where faith and family meet real life. Maxwell Sharpe may make his living on the ice as a pro hockey player, but he feels most at home in the kitchen. Which is why he lives for the three-week culinary vacation he takes each year in Hawaii. Upon being paired with Grace for a cooking competition, Max finds himself drawn to her passion, confidence, and perseverance. But just when Grace dares to dream of a future beyond her hometown, Max pulls away. 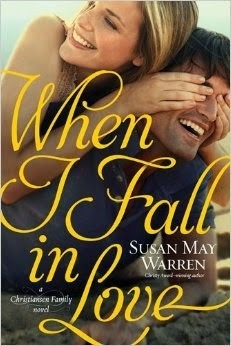 I've just been introduced to Susan May Warren's books this year and I have to say I have enjoyed the couple I've read immensely. I've been hearing high praise for the Christian Family series, so I was excited when this book came up as a review book. I've really come to enjoy the family based series. It helps introduce new characters and keep the old ones around for a while. They are able to show the true family dynamic, that no matter how good the family looks on the outside, things are always going on, on the inside. It is fun to read about families in novels that seem to good to be true at times to slip away, but I've really come to enjoy the realistically portrayed ones. Another winning aspect to When I Fall in Love is the setting! Hello Hawaii! Any book set in that gorgeous group of islands is a fantastic book no matter what. Susan May Warren was able to give you all the beauty of the islands in this story through the character's eyes. And food, so much delicious food is mentioned in this story, I think this was the one story I've read that made me want to snack the whole way through. I was surprised (in a good way) at the issues that were focused on in this book. They can be difficult issues, but they are ones the people battle every day. It made these characters so much more real watching as they battled these problems. These issues were not candy coated and the emotions that are shown as different aspects popped up had you hoping for the best. I really enjoyed "traveling" to Hawaii in this book. And I really want to pick up the first two books! Thank you to Litfuse Publicity and Tyndale House, I received a copy of this book for free in exchange for an honest review.